It’s no secret I like to cook, mostly because I like the result of liking to cook- tasty food! Sometimes I have an hour or so to make dinner, but much more frequently I need to be able to put dinner together in less than 30 minutes. I know so many of you can relate. 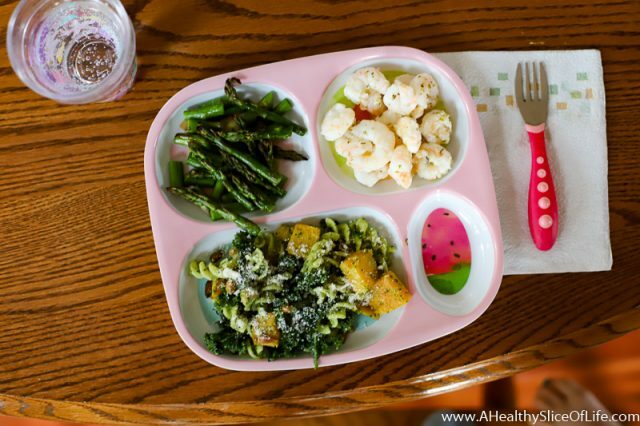 I’ve received several messages from you mamas that work looking for QUICK healthy kid dinners. While I won’t insult you by pretending to know your particular challenges, I have my own struggles with juggling responsibilities and time management so I get it. 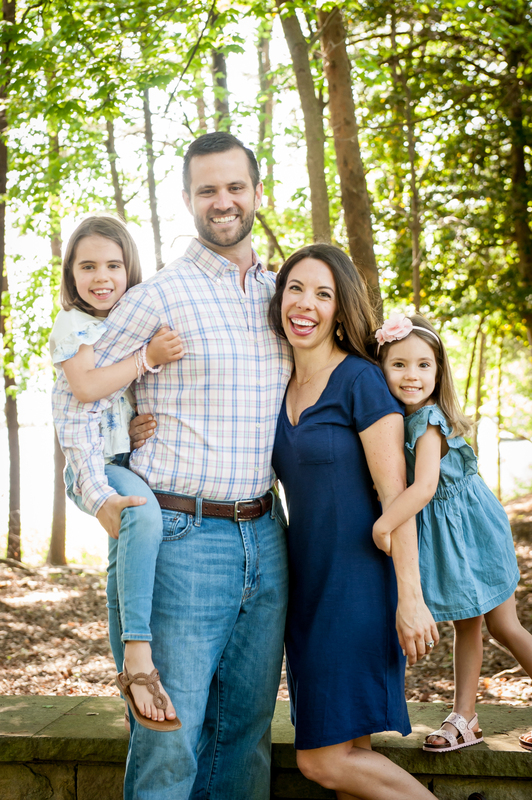 We aren’t a take-out kind of family because A) maybe we don’t have many take-out options where we live, but most of it doesn’t excite me (except pizza- that always excites me). And B) I’ve made home-cooking a priority because I know it makes healthy eating happen more easily. 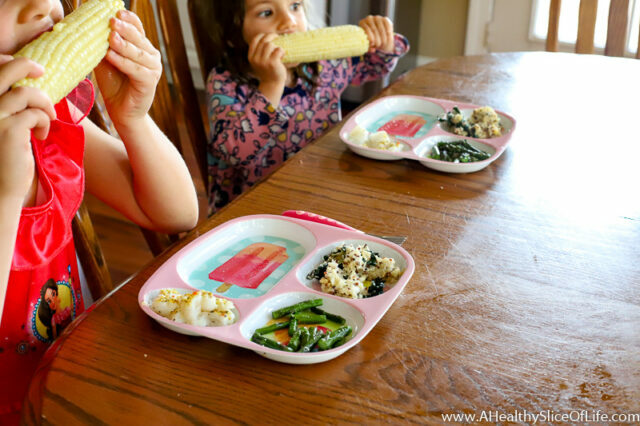 I wanted to share a few healthy kid dinners (they’ve actually been family dinners, but you get the point) that we’ve eaten recently and how they come together in 20 minutes or less. 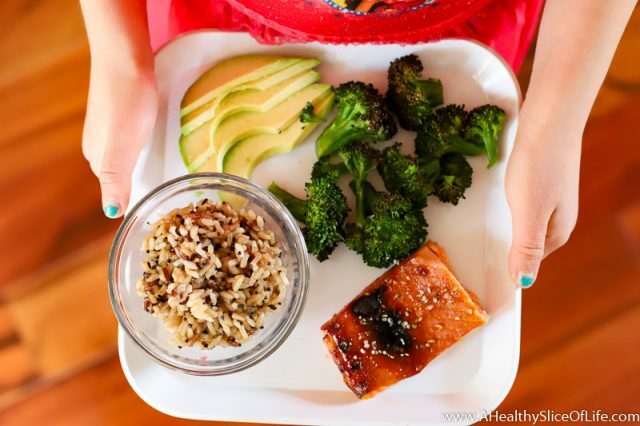 Baked Bourbon-Glazed Salmon with Roasted Broccoli and Rice Pilaf. I make the marinade the night before. In the morning, I put the salmon in the marinade and leave in fridge. When ready to make dinner, I preheat the oven to 400 degrees. While it preheats, I place the broccoli on one side of a rimmed baking sheet and salmon on the other (or on two separate baking sheets depending on portion sizes). Bake for 15-18 minutes until the fish flakes easily and the broccoli is crispy. I microwave the organic quinoa and brown rice pack in the microwave for 90 seconds. Then I add some sliced avocado and call it dinner! I make a marinade and chop the portobello mushrooms, bell peppers, and onion the night before. I combine them all in the morning in a large ziplock bag. When ready to cook dinner: I heat a large skillet over medium heat, dump the vegetables into the skillet and saute for 10-12 minutes until soft. Meanwhile, I mash two ripe avocados with lime juice, salt, and cumin and microwave the 90 second organic Spanish rice. Assemble! Tortilla, sour cream, veggies, rice, and guacamole. If I want more protein, I’ll use a can of refried beans, too. The night before (or on food prep day), I make the kale pesto pasta salad with roasted butternut squash. Usually I double the amount of pasta when I want it to be more of a main. I keep that in fridge. When ready to make dinner: I preheat the oven to 400 degrees and pull the kale salad out of fridge to allow it to warm up a bit. Mix well. I chop the ends off the asparagus then spread the stalks on a baking sheet. I drizzle with olive oil and sprinkle with salt and garlic granules, then roast for 12-14 minutes. On the stove top, I melt butter and add a little oregano and garlic (freshly chopped or the squeeze kind from the fridge). Then I saute shrimp for 6-8 minutes until cooked through and serve! I start by putting a big pot of water on, covering it and bringing it to a boil. While it heats up, I chop bell peppers or another easy vegetable like snap peas or carrots. I open the hearts of palm and drain and slice avocado. I boil pasta for 10-12 minutes, drain, mix with marinara sauce and sprinkle Parmesan cheese on top. 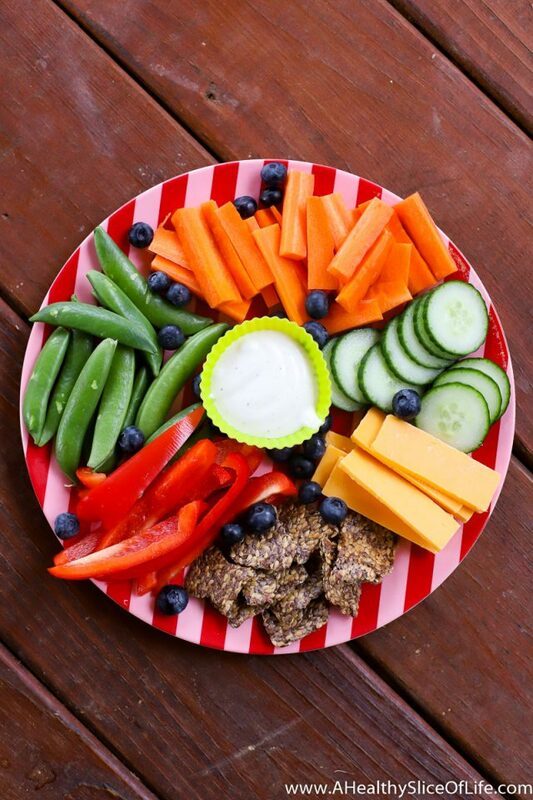 Any combination of fruits, vegetables, crackers, cheese, and dips always makes for a suitable (and popular!) lunch or dinner option in my opinion! The night before, or on food prep day as this salad holds up well in the fridge, I make this zesty Greek salad, without the pasta. 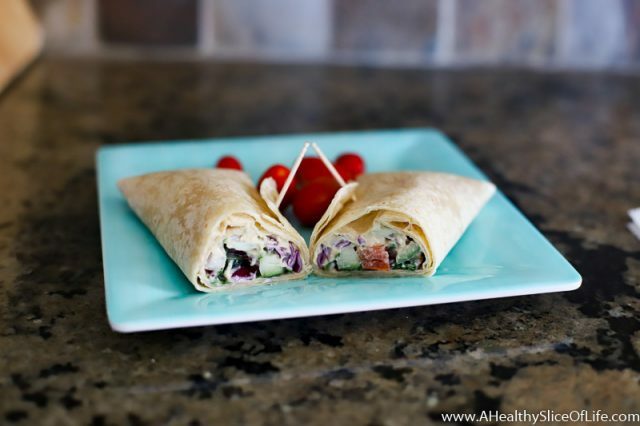 When ready to eat: I smear hummus on a wrap, fill with Greek salad, add tzatziki (if desired). Then I roll up, stick with a toothpick and cut in half and serve with fruit or cherry tomatoes. I obviously keep staples on hand that help with quick and easy healthy dinners and lunches! These five items can almost cover ALL the meals in a day. I love Fage yogurt for its creaminess (we’ve tried the dairy alternative yogurts but for right now, I’ve gone back to regular yogurt for the kids because of the more simple ingredient lists) and granola (they both loved this clean-ingredient Engine 2 variety). They make a quick kid breakfast! Then Ancient Harvest’s lentil-based pasta and Rao’s Homemade sauce (which has no sugar added and tastes delicious!) make a complete dinner on their own for busy nights. 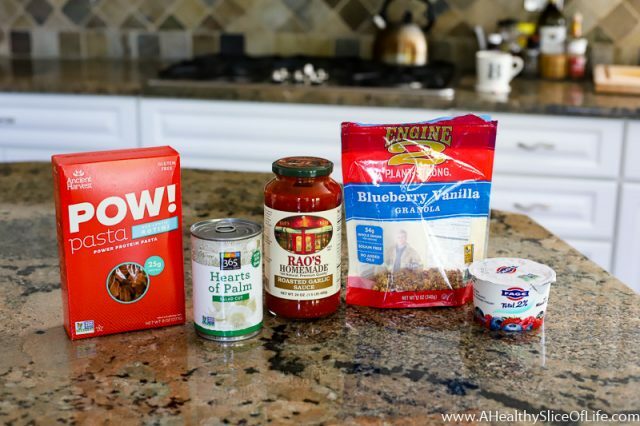 TIP: A lot of the brands I love are $1-$3 cheaper per item through Thrive Market. If I throw together PB&Js with the hearts of palm on the side (my girls and I LOVE hearts of palm), we’d be all set! I know I show the more elaborate dishes at times (I’m looking at you cauliflower pizza bites) but the reality is with the help of food prep on the weekend or earlier in the day, most of our meals come together in less than 30 minutes! What are you best tips or favorite meals when you want a fast, healthy dinners? Oh, and don’t let me forgot to add that we have a healthy pantry stock of Annie’s Mac ‘n Cheese too!! 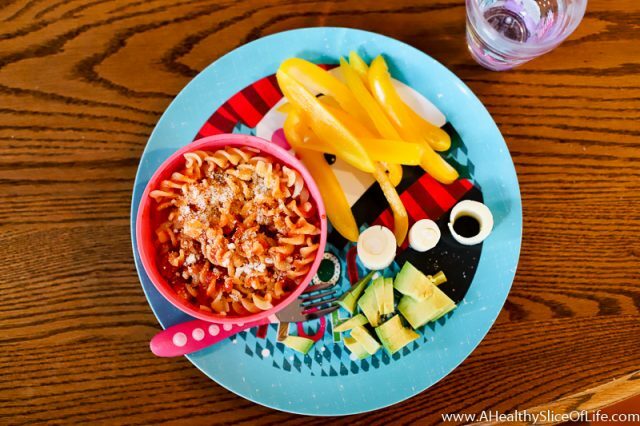 My favorite “healthy” dinner for the kiddos is Annie’s mac, but while the pasta is boiling, I throw in frozen peas, shredded carrots, and cauliflower rice. I never feel bad about Mac and cheese night because my toddler eats tons of vegetables that way. 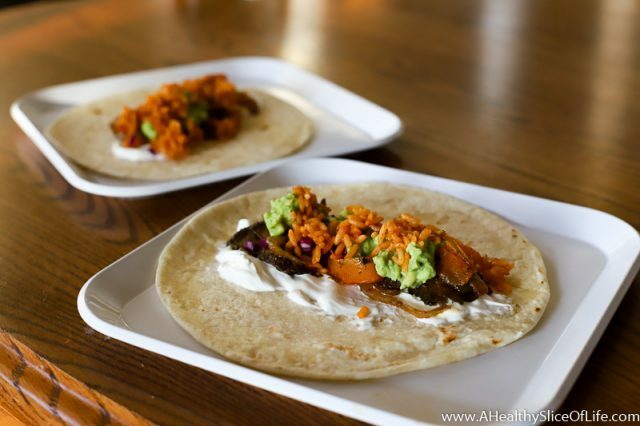 We also love quesadillas and it’s easy to tuck some spinach or cauliflower rice in those as well. Everything is served with avocado because…avocado! Oh I love the idea of throwing cauliflower rice in! Do you just add it in at the end? I’ll have to try it- thank you! We do riced Cauliflower too! She doesn’t even know it is there! How/when do you add it in? would loveee to try this! We also do Friday night Mac n cheese movie nights. Bath and jammies at 5 and dinner at 5:30. I add red lentils to the Annie’s pasta and then when that is cooked and drained, i add some butter to the pot and frozen cauliflower mash, Greek yogurt and nutritional yeast + some of the packet of the cheese powder. My daughter wont accept chunks of veggies in her Mac, so this adds a ton of creaminess and veggies. Bring on that salmon dish! The focus on time is so important. Many people simply don’t have as much time to cook as they would like to. Yet, healthy eating is so important. Finding healthy meals that are fast and easy to cook is a powerful solution and I love your ideas here. Love these ideas for when Cam is older. Right now I’d love for her to eat more of what we eat for dinner but we never seem to have much leftovers because we have them for lunch! I’ve been giving her deconstructed items from our dinners (example; tonight we had black bean mango tacos w/ a coconut yogurt sauce & I gave her some black beans, mango, and yogurt).